I have gotten so many wonderful comments and e-mails from you lovely folks. It makes it worth all the work. I guess everyone loves a compliment. I know I do. Thanks. I worked long and hard to make this room come together but I had so much fun. It was great to be able to fluff one room in the house. I am surprised that I didn’t add more pink. But, it’s not too late! Wouldn’t a few pillows made of vintage linen in pinks, blues, and whites be sweet? I also want to use my blue Wedgewood Jasperware collection in here. I love my jelly cupboard. My brother built it and a brother-in-law made the pierced tin doors. I did a new decorative finish and added a small crystal knob with a vintage back plate behind it. The three plaques (a diy project) are perfect for this small area. Flowers are always lovely in silver teapots. Don’t you agree? Tattered books are everywhere now. How many books like these have you thrown away?!!! Me too! These belonged to G-Man’s mother. I still can’t believe how closely the drapery fabric matches the pair of pear chairs. I probably have 25 more yards of this fabric!!! I haven’t shown this piece since I posted about it’s make-over. And, I am only showing the top now because it’s still not finished!!! I love the wooden horse and who doesn’t like dried hydrangea? I am so pleased with the bed. Smaller pillows will eventually be added. I found a gorgeous European pillow in cream linen with a generic embroidered monogram that was scrumptious. I may cave and buy it instead of making one. We shall see. The top of this has been changed more than my outfit on Easter morning. The crystal lamp is repaired and back up there now. I can’t even remember where I got the little mirrored clock. The “Waterford” crystal picture frame was discovered at a junk shop for $14.00!!! Crazy, huh??? Those kinds of finds just make your heart flip! Oh, that’s me and G-Man in Seattle leaving on an FBI dinner cruise. A before and after post about specific things in the room should finish up the guest room make-over posts at our Blue Creek Home. 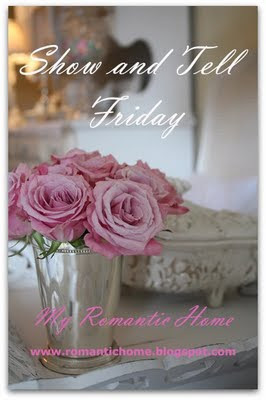 For more great inspiration check out "Show and Tell Friday" @ "My Romantic Home". Now, some of you little chick-a dees need to come visit me. Hi Rhonda ~ I'm here from Miss Mustard Seed's blog. This room is gorgeous! You did a fantastic job and I think you should submit it to Romantic Homes Magazine. Love your drapes and the chairs. The bed is just beautiful. Rhonda, this is so pretty. Soft and elegant but rustic too. How fun is that headboard! Can I take a nap there after I finish the cheescake? This room is exquisite! Any guest would be thrilled to stay here! I'm still drooling! By the way, you're feature is up on my website and I have a brand new Furniture Feature Friday button if you want to grab it. Lots of great comments so far! Beautiful room. I LOVE the bed. This looks like it is right out of a home decor magazine. It's gorgeous!! What is the name of your wall color? I've been thinking about repainting my Master bedroom a soft blue and it looks like you found the perfect shade. wow...beautiful!! I just found your blog thru Mustard Seed Creations & I'm so glad I did!! Love the blue you painted your jelly cupboard ~ and the bed is totally fabulous.... everything is just gorgeous! SOOOOOO BEAUTIFUL!!! That headboard!! Gorgeous! Hydrangeas? My favorite flower! I love the color of the walls too! Wow, such a beautiful post you have shared today. Your makeover room is gorgeous!! Love the color and the decorative touches. ?Great job!!! Oh~my~gosh....LOVE that headboard!! The room is beautiful. What a beautiful room. The colors, all your wonderful treasures, just everything is gorgeous. Rhonda ~ I couldn't find your email, so I'll just comment here. Absolutely, you can submit to a magazine. Probably via email too. I would get a magazine, like Romantic Home, look in the front for the contact information and email with a couple of your pics or a link to this blog post. They would be very foolish not to consider you, in my opinon. What a lovely room.....it would be a pleasure to sleep in it. Oh my! What a beautiful guest room! The color on the wall is so soothing and calming. I LOVE that headboard!! Love the silver teapot with the flowers, the vignette with the mirror and wreath, the tiny glimpse of your armoire top! Love love love the Jelly cupboard!! Hi, Rhonda! I just stumbled upon your blog and I am in LOVE!!! SO charming and inspiring!! You are 'bookmarked' for sure!!! This is one BEAUTIFUL and creative and classy, and fabulous room!!!!!! Ohhh my goodness, Girlfriend...I do believe that this is one of the prettiest bedrooms that I've ever seen!!! I just adore it...this is my favorite design style!!! Ohhh yes...I could move right into your newly decorated guest bedroom and be perfectly happy!!! Hehe! You did say it's a guest room, right? Darlin', you did a fabulous job with this makeover!!! Of course, the "star attraction" is that fabulous frenchy bed!!! It really is the prettiest bed that I've ever seen...you're so creative to have used an old mantle for the headboard! I have to tell you...I am sooo copying this idea if I ever find a pretty mantle! Hope you don't mind and take it as the highest form of a compliment! Love, love, LOVE your little blue jelly cupboard...the finish is gorgeous!!! Ohhh...and I just adore each and every accessory that you've added to this room! It feels so fabulously French...and I love it!!! This room is definitely magazine worthy!!! Congrats, my friend...for creating such a beautiful and successful design!!! I'm so glad that you shared this with us today...it's the sweetest treat ever!!! I never get tired of seeing this beautiful creation!!! I have almost zero blue in my house...just a little in my future grandbaby room...you are making me want more. I am in love with all of the vintage touches...another thing I need to add more of!!! I always leave here so inspired. What a gorgeous headboard ! Great inspiration over here! Love it! I still can't get over the gorgeous headboard!!!! Your guest room is gorgeous...and the headboard is beautiful. Thank you for sharing. ~WOW! Rhonda this guest room is truly stunning! I just LOVE the topiary and the ornate, elegant mirror. Oh I have to find something like it. I just ADORE it together!!!! ~Lovely. Thanks for your sweet visit my friend. I really appreciate it so much. Isn't Cathy the sweetest blogger? She is having such a nice giveaway. I need to add her giveaway to my post right now. I too love your jelly cupboard! Right up my alley. And I also love your doggies in the sidebar! What an incredibly beautiful room!!! Wish I was staying in it, LOL!!! My favorite is the stunning headboard!!!! Where did you ever find it? It's so unique!! Oh my! The blue is so calming and restful...and the headboard! WOW WEE! It is just gorgeous! I love everything you have in there...I would LOVE to be a guest in this room. Thanks for sharing! Oh my gosh....What a GORGEOUS room!!! It's so soft and peaceful! I love the color on the walls and that bed it to die for!! Thank you so much for joining in on Show and Tell! What a fabulous room!!! And the bed, oh my!!! You could rent out your guest room as a bed & breakfast and make a killing. I would so pay to stay there. It's so beautiful and calming... I love it! Be proud.. you did a wonderful job! Just coming back by to take another peek of your fabulous french guest room while I was here visiting your Show & Tell Friday post. Ahhh...votre pièce d'invité française est tellement très belle. J'adorerais juste être votre invité, mon ami!